Although they were able to stop Syndrome, the damage caused while trying to stop the Underminer (John Ratzenberger) again raises the discussion that “supers” should be illegal. Rick Dicker (Jonathan Banks) relocates the Parrs one last time and tells them the Super Relocation Program is being discontinued. The Parrs will have to live as their secret identities in a small hotel room. Winston Deavor (Bob Odenkirk) and his sister Evelyn (Catherine Keener) set out on a plan to make supers legal worldwide. They recruit Helen – aka Elastigirl (Holly Hunter) to be the face of the effort. Bob (Craig T. Nelson) is stuck at home helping Dash (Huckleberry Milner) with homework, Violet (Sarah Vowell) deal with her teenage drama, and Jack-Jack (Eli Fucile) with his newly discovered powers, all while Helen is out having the adventure he dreams of. When Helen is up against Screenslaver (Bill Wise), a villain who controls people with hypnotizing screens, Bob, the kids, and Frozone (Samuel L. Jackson) meet up with some new supers to take him down. Even though it’s been 14 years since we last saw the Parr family in action, Incredibles 2 picks up the moment we left off. I’ll admit, I was a little nervous about how they would follow up one of my favorite animated movies, especially after so long. The anticipation was so high, I didn’t think they would be up to the challenge. I was more than pleasantly surprised. All of your favorites are back in action. Fortunately, this means we get almost all of the original cast back, reprising their roles. Only Dash has been replaced, due to the actor having grown up in the last decade and a half. It’s like we never left the crew. Holly Hunter gets her time to shine as Helen takes center stage. Craig T. Nelson’s Bob is relegated to the role of stay at home dad. He’s as anxious to get back in the action as he was in the original, but realizes it’s Helen’s turn now. While Huckleberry Milner’s Dash and Sarah Vowell’s Violet are basically the same as when we last saw them, Eli Fucile’s Jack-Jack gets quite a bit more screen time. In the original, there were hints of some powers. Now, he has an impressive arsenal of super powers that he isn’t afraid to use, even if he doesn’t quite understand them and can’t really control them. He is a great addition to the family/team and provides for more than his share of funny moments. I only wish we had been given just a little more Edna. If you get the feeling that the story feels a little familiar, you’re not alone. 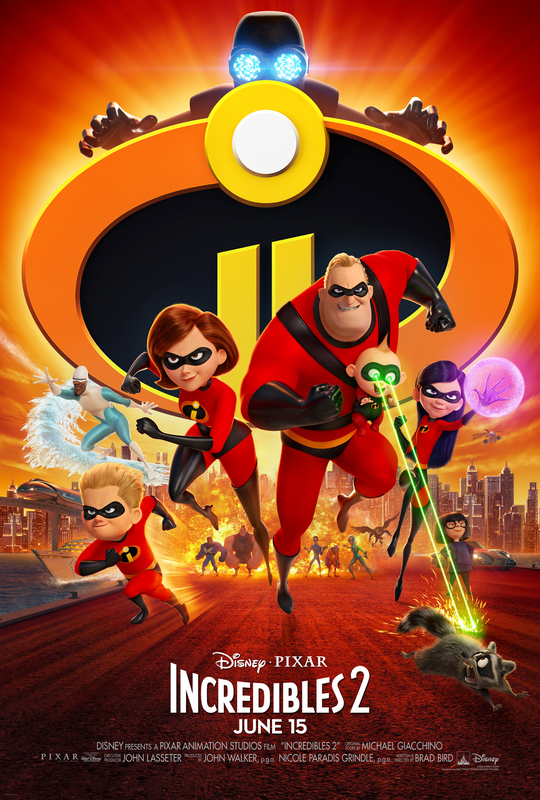 Incredibles 2 follows almost the exact storyline and formula as the original. This is my one complaint about the movie. Writer/director Brad Bird takes the script and swaps Bob for Helen. It shouldn’t work, yet somehow it does. The characters are well developed, the action scenes are exciting. It’s everything you want from a Pixar movie. There aren’t many options for family films out at the moment. This makes Incredibles 2 an easy choice if you’re looking for something to do with the kids. Luckily, it’s an excellent film that is almost as good as the original Incredibles. If you’re a fan of the first film, you will absolutely love the sequel. It was definitely worth the wait.